Pro- and anti-Brexit supporters have vowed to step up their campaigns after European Union leaders gave Britain a six-month extension to the process of leaving the bloc. The extension of the so-called Article 50 process averts immediate concerns of Britain leaving without an exit agreement with the European Union. The new deadline is October 31. The delay could mean Britain will take part in EU elections scheduled in May. And there are still few signs that British lawmakers will approve Theresa May's proposed Brexit deal, further prolonging the political chaos. EU Council President Donald Tusk announced the extension early Thursday. European Council President Donald Tusk reacts as he holds a news conference after an extraordinary European Union leaders summit to discuss Brexit, in Brussels, Belgium, April 11, 2019. "During this time the course of action will be entirely in the UK's hands," he told reporters. "It can still ratify the withdrawal agreement, in which case the extension will be terminated. It can also reconsider the whole Brexit strategy, that might lead to changes in the political declaration, but not in the withdrawal agreement. Until the end of this period the UK will also have the possibility to revoke Article 50 and cancel Brexit altogether,"
He added a message for Britain: "Please do not waste this time." Addressing British lawmakers in parliament Thursday, Prime Minister Theresa May renewed calls for compromise. "The choices we face are stark and the timetable is clear.I believe we must now press on at pace with our efforts to reach a consensus on a deal that is in the national interest." If the British parliament ratifies the Brexit deal it can leave the bloc before October. EU member states are due to hold European Parliament elections beginning May 23. If Britain is still a member it must take part — and that would likely exacerbate deep divisions, says Alan Wager of the UK in a Changing Europe Program at Kings College London. "The European elections are going to be fought not just on the machinations of what these MEPs [Members of the European Parliament] might do, but on issues of identity, on issues of anger," he said. Theresa May's deal has been rejected by dozens of pro-Brexit lawmakers in her own party who want a looser relationship with Brussels, among them Jacob Rees-Mogg. 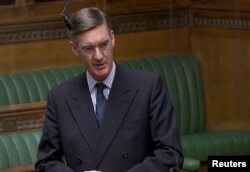 Britain's Conservative MP Jacob Rees-Mogg speaks in the Parliament in London, Britain, April 3, 2019, in this image taken from video. "People expected to leave on March 29 and here we are heading towards Halloween.There's some symbolism in that I think," he said Thursday. After failing to win over her own hawkish MPs, Prime Minister May is taking a different approach — reaching out to the opposition Labour Party to try to get the deal voted through. Labour's price is a closer relationship with the European Union and possibly a second referendum. "As we get further and further and deeper and deeper into the hole that Brexit has created, the idea of a referendum as the only route out is gaining some currency among MPs and is gaining some support in the country at large," said analyst Wager.